Day 1 Arrival to Murmansk, Russia. Meeting at the Murmashi airport and transfer to your independently booked hotel in Murmansk. Free time in the city. Meeting with guide, check-out your individual and group gear, general instruction. Introductory dinner. Overnight at hotel Introductory dinner. Overnight at the guesthouse. Day 2 Information meeting, where our staff will brief you on the situation at the Barneo region, planned departure time and answer your questions. Packing the expedition sledges. Overnight at hotel. Day 3 Transfer to the airport for the flight to Franz Josef Land (technical stop over) and to Barneo Ice Camp by our AN-74 (approximate flight time 2 hours 30 minutes each segment). Arrival to Barneo, which is about 89 degrees north latitude. Lunch in Barneo mess-tent. Pitching the expedition camp at Barneo site. Overnight at the expedition tents (1 tent accommodates 2 persons). 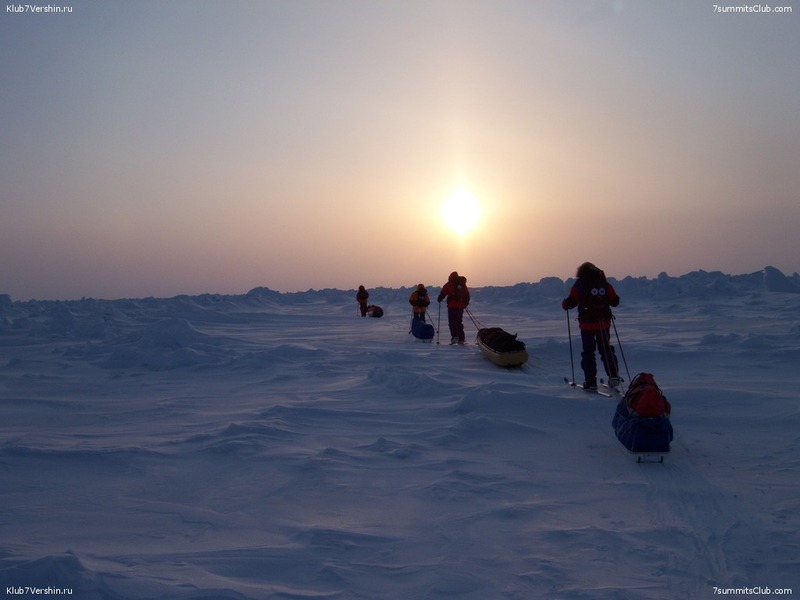 Days 4-13 Ski trek to the North Pole, overnight sleeping in the expedition tents on the drifting ice. The start point will be decided in dependence on the ice conditions. Day 15 The North Pole Certificate ceremony. Time and place are to be discussed with expedition participants and announced in advance. Night at the hotel. Day 16 Free time. Transfer to the airport for your flight home. We get up at about 7 o`clock in the morning. Start the stove. When the stove is on we start melting the snow to get water. If you were smart, you had reserved some hot water in a termos to start the process of water making. As soon as the water is hot we make oat meal with milk, butter and some fruit. A cup of coffe or tee will make you completely awaiken. You still have time to enjoy biscuits and cheese or salami in a warm tent. But remember that at 9 o`clock you must be ready to go out of the tent. Almost every two hours we make a break in our skiing routine. During these 15 minutes breakes you can dring and eat sweet energetic things. The personnel consists of the professional scientists and polar explorers - acting as logistics supervisors, lead guides and creators of the programs. Every group must have a first-aid kit. Every participant must have insurance with 50 000 euro coverage. The air temperature in the Pole vicinity during the expedition period lies usually between -20 C° and -35 C° and it is good if you have endured it in the past. Apart that wind may dramatically increase cooling effect. Daily temperature deviations in the Arctic are not significant in April. Sun neither sets nor rises high over the horizon.